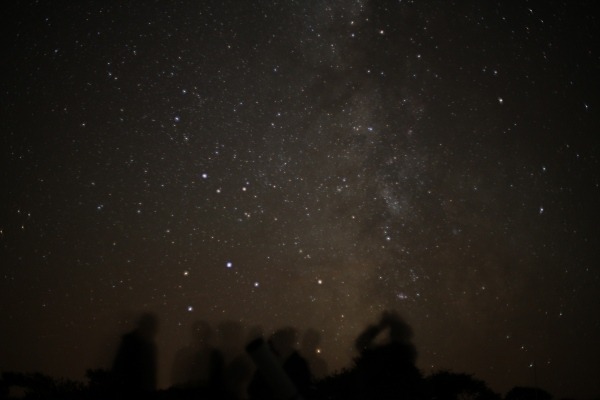 Astronomy tourism is a burgeoning field – luckily for me, as it’s how I make a living! – with city-folk now starting to make the effort to travel to places with darker skies, in the hope of seeing things that simply cannot be seen from the orange glare of a town sky. Galloway Forest Dark Sky Park, which I helped establish in 2009, has seen a lot of this dark sky tourism trade, due to its high profile in the media, but many other places around the country – Sark in the Channel Islands, and Exmoor National Park to name but two – have followed suit, hoping to attract the stargazing crowds. And as more and more people come out of the city for a stargazing weekend under dark skies it’s becoming clear to me that there’s a real appetite for seeing the Milky Way and other elusive dark sky objects. It’s almost become something to put on your “bucket list”: see a wild lion in Africa; fly in a hot air balloon; see the Milky Way. However there are lots of other amazing astronomical objects visible under a dark sky so here is the first installment of my top-ten “Dark Sky Bucket List”. Our “island universe”, a spiral disk of hundreds of billions of stars, appears in our night sky as a band of grey light arching overhead. From town centres the Milky Way is invisible, lost in the orange glow, but as you move out into suburbia you might start to see traces of it, looking directly overhead. 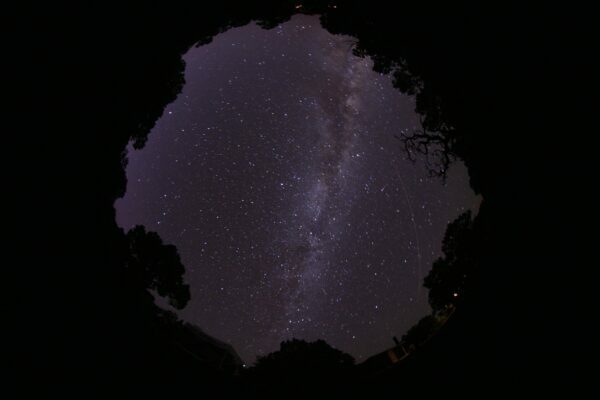 According to the Bortle Dark Sky Scale, under suburban skies (Bortle Class 5) “[the] Milky Way is very weak or invisible near the horizon and looks washed out overhead”, while under rural skies (Bortle Class 3) “[the] Milky Way… appears complex” with structure – dark clumps and bands – set within the grey light. Under perfect conditions (that probably aren’t found anywhere in Europe) of Bortle Class 1, “[the] Scorpius and Sagittarius regions of the Milky Way cast obvious shadows on the ground”. The best we can hope for in the UK – which you might just get in the darkest heart of Galloway Forest Dark Sky Park – is Bortle Class 2 which reveals “[a] highly structured… Milky Way”. Although our Milky Way galaxy contains hundreds of billions of stars, only the closest ones to the Sun are visible as distinct dots in our night sky. From a city sky you would be lucky to see a couple of hundred stars on any clear night – the brightest ones that make up the constellation patterns – but move to somewhere darker and more stars will be visible. Once you get to very dark skies the only limit on how many stars you can see is your eyesight. Assuming you’ve got good eyesight thousands of stars will be visible under a dark sky. The Yale Bright Star Catalogue lists all stars brighter than magnitude 6.5, the approximate limit of human vision, and that list contains over 9000 stars, so if you’re at a dark site (Bortle Class 3 or better) you’ll see around 4500 stars (as you can only see half of the sky at one time). The Andromeda Galaxy is our nearest BIG neighbouring galaxy. It lies 2.5 million light years from the Milky Way, and contains even more stars than our galaxy. Even still, it appears as only a small grey smudge in the night sky. From bright city skies (Bortle Class 8) the Andromeda Galaxy is “barely glimpsed by an experienced observer on good nights”, while in bright suburban skies (Bortle Class 6) it is “modestly apparent to the unaided eye”. As you head to darker skies though, Andromeda becomes even more apparent, until under rural skies (Bortle Class 3 or better) you will see it as a very obvious smudge amongst the clamour of stars. 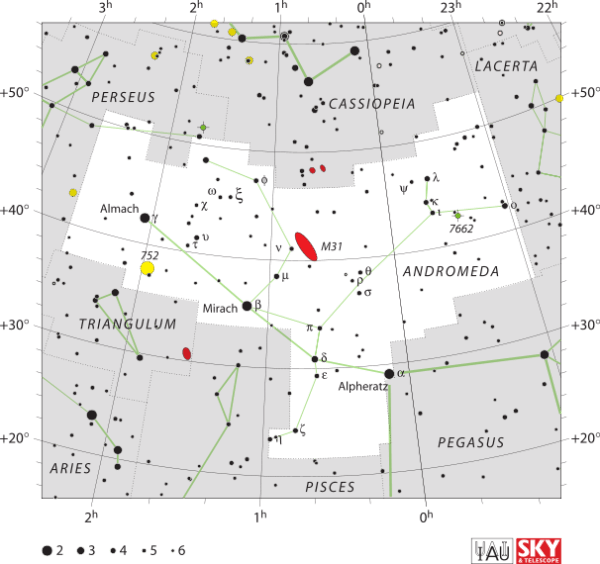 Andromeda is relatively easy to find using the constellations Cassiopeia and Pegasus as signposts. Using the W-shaped Cassiopeia, take the right-hand V of the W shape as an arrow that points to the bright star Mirach, or ? Andromedae, which sits in the middle of a slightly curved line of three stars, with Alpheratz (? Andromedae) on one side and Almach (? And) on the other. Go perpendicularly “up” (back towards Cassiopeia) from Mirach to a much fainter star u Andromedae, and then continue the same distance again to find the Andromeda Galaxy. 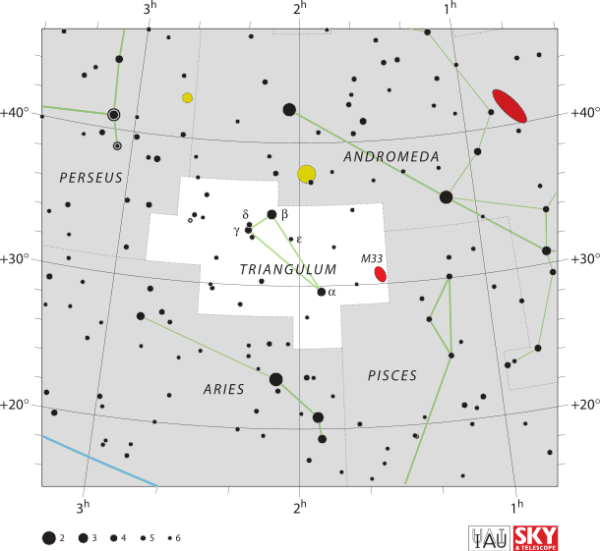 Far more elusive than the Andromeda Galaxy is the Triangulum Galaxy, M33. Indeed it is so elusive under anything except near-perfect dark skies that it is used as the benchmark for judging how dark your sky is. It is only visible to the naked eye under Bortle Class 4 or better. At the suburban/rural transition (Bortle Class 4) it is “a difficult averted vision object, only visible when higher than 55° “. Under rural skies (Bortle Class 3) it is “easily visible with averted vision”, but it’s only at truly dark sky sites (Bortle Class 2) that it becomes “easily seen with naked eye”, and in excellent dark sky sites (Bortle Class 1) it is a “direct vision naked-eye object”. It is located near the Andromeda Galaxy, in the opposite direction from Mirach. 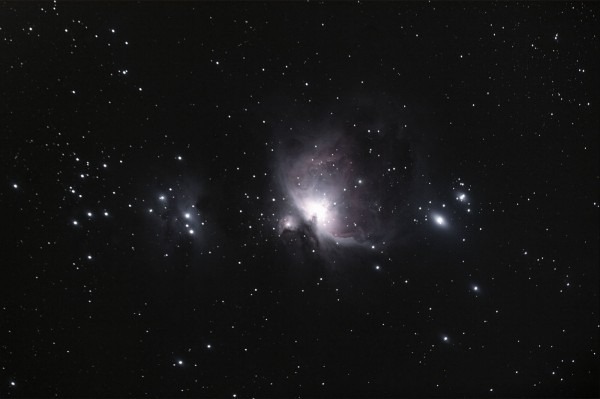 The Orion Nebula is one of the brighter nebulae in the sky, and therefore is seen relatively easily. It lies in the middle of Orion’s sword. Under suburban skies it will be visible to the naked eye, but take binoculars out under rural skies (Bortle class 4 or better) and you’ll be treated to a stunning view of this beautiful object. The Orion Nebula is a region of star birth, located only 1300 light years away. Coming in part two! Meteor Showers, Northern Lights, Zodiacal Light, Gegenschein, and The Green Flash. Have you been lucky enough to see any of these objects under a dark sky? What would be one your dark sky bucket list?